Boring standard lamps & lightings can spoil the finish of your well-planned decor. With our range of lamps and lighting products, convert this utilitarian accessory into another classy or ethnic addition to your stylish decor. Check out table lamps, antique pendulum clocks, cuckoo clocks online to convert an ordinary desk into an elegant decorative accessory. Enhance your home’s vintage feel and save power by replacing incandescent bulbs with these beautiful vintage lamps and lightings. Even if the lights in a room are already beautifully placed and making perfect sense from an aesthetic point of view, even if the room may feel quite complete design-wise and as far as the ceiling lights and table lights are concerned, you shouldn’t overlook lanterns. 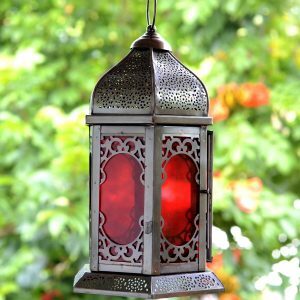 It’s true that not all rooms are suitable for hosting lanterns and tea lights, but when you do find the appropriate place for one of these, the impact they can actually have on that space is nothing short of amazing. Nothing can bring on a cozy vibe faster than a just-lit lantern or tea light holder. Of course, most lanterns can serve as self-standing decorations by themselves, even when not lit. The more elaborate the lantern or tea light holder is, the better it can be integrated into the overall theme of the room’s design. This type of functional decoration can also be displayed outside of the house as well, for example on a garden table and so on. Some of them (the models of garden lanterns) are meant to be installed directly on the ground, in the grass, or next to your pathway. You can even find stylish candle holders in our collection. Whatever the style you’re interested in (vintage, retro, ethnic, minimalistic, or industrial and so on), you can find the perfect match in our collection of lanterns. Remember not to leave your candleholder, lantern or tea light holder burning without anyone to supervise it. When you’re not able to pay attention to the candles lit in the lanterns, let them serve simply as the wonderful decorations they are.